He had the great idea to get me a few months in advance, that way I wouldn't have to worry about the cost and could get what I wanted...awwww :) Since I was able to get the 6 months applied right before the month's box pick came around, I didn't miss out on September's customized box! 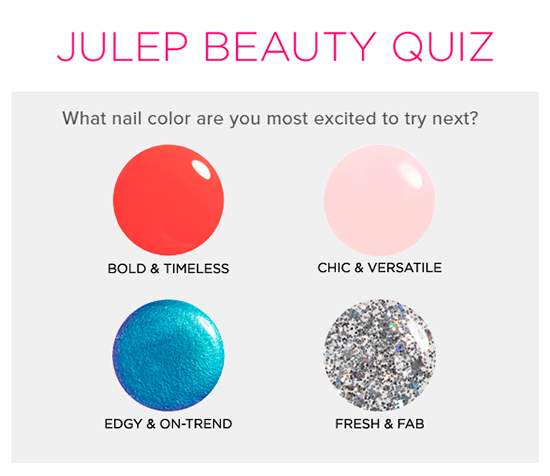 If you haven't heard about Julep or don't know that much about the company, they are one of the few monthly services I have decided to keep around. There have been ups and downs for me, but their customer service has always been absolutely wonderful and there's usually at least one product out of my box that I LOVE- sometimes more than just one! BONUS ~ Julep signature creme *Just for fun! You can purchase these products individually whether you're a Maven/member of Julep or not, however if you get these bundled up in a monthly subscription box as I did- then you're going to save quite a bit ;) I managed to score all of the 3 items listed above in September's box and it was around $25, which is about a savings of $24 if I was to have bought these separately! Looking at the first product listed, Skip the Brush, was something that I was really excited to give a try since I LOVE cheek/blush products and this is a fairly new ventured for Julep as well! The nicely-designed container makes it a cinch to use and you can get up just the right amount of product for application. The color I chose turned out to be perfect and seems that it would go well with most skin tones and types: I have super sensitive skin and it's very fair, yet this product and color worked well for me. I didn't end up looking over-done or "clownish" and the formula didn't cause any breakouts either :) You can build easily with Skip the Brush since it's a stick-like cheek balm, but it does a decent job of lasting all day as well. As for the last item listed that came in my Julep September box- the nail polish in Aubrey, was the surprise pick for me in this month's choices. I'm not necessarily into darker colors, however this one really stood out and I thought it was a perfect color for the fall season and I was right! The picture really doesn't do Aubrey much justice either, but I can tell you that with 2 coats and Julep's clear top-coat = super cute! All in all, I was really happy with my choices this month and I'm glad I got to come back in at just the right time! Holloween/October and the Christmas or December boxes are some of my FAV's and they are coming up- don't worry, I will definitely make sure to share with all of you my future 5 boxes!